It’s been a head-scratcher for quite some time. 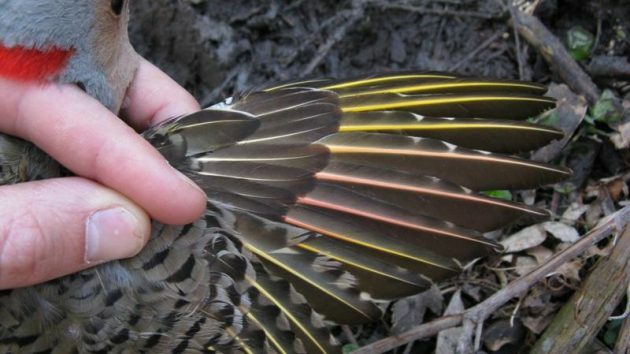 What’s with the yellow-shafted Northern Flickers in the eastern U.S. bearing some orange feathers? (As in the photo above, courtesy of C. Hansen) The birds in question weren’t anywhere near the mid-continental hybridization zone where they could fraternize with their western red-shafted brethren. New research in The Auk: Ornithological Advances appears to have zeroed in on the culprit. During their fall molting period, this population of Flickers has become fond of feasting on the ripened honeysuckle berries. In particular, the birds are picking up a pigment called rhodoxanthin from two invasive varieties of honeysuckle, as revealed through spectrophotometry and chromatography. Where Are You Birding This Third Weekend of October 2016?